But go to the Independent forums of any comic book Website and it's practically a ghost town--an average of two or three replies per thread, and those are usually by the book's creators saying "Please read my book!" The Internet is a place where fans have complete freedom to make their voices heard, and the voices are saying resoundingly, "We love mainstream comics." Josh is right. Wizard is what it is. An increase in indie coverage wouldn't change what people buy. I would like a small increase in alternative/indie coverage. Is it too much to ask for four pages a month, instead of the standard two pages from their Secret Stash? Time magazine declared FUN HOME Book of the Year. AMERICAN BORN CHINESE is the first graphic novel ever nominated for a National Book Award. BONE sold over a million copies through the Scholastic Graphix imprint. PERSEPOLIS is being made into a full length animated feature. Houghton Mifflin's Best American series released a BEST AMERICAN COMICS 2006 anthology. Not to mention, DC's Minx imprint suggests corporate confidence in indie/small press styled content. Surely, there's an audience, and it could benefit Wizard to expand to four pages? I agree with Josh 100%. But four pages, instead of two. I'll put up with Wizard's bizarre Wolverine fetish if you just give me two more pages. Not only is Becky Cloonan one of the most talented people in comics, she's also one of the smartest. Read her post: If monthlies are wrong, I don't wanna be right! She hits the nail on the head. A b&w Shonen Jump-esque monthly anthology would be incredible for American comics. Maybe even do it in a 6x9 digest size with a spine? You'd just have to get the right creators onboard. My dream line-up: Paul Pope, Gregg Ruth, Scott Morse, Becky Cloonan, Dave Crosland, Kristian Donaldson, Christine Norrie, Colleen Coover, and Nick Derington. That being said, with a little bit of money, Act-I-Vate or The Chemistry Set might be a perfect crew to get this started. Jennifer Contino interviewed me for the Pulse (click here). It's my first interview about ASTRONAUT DAD. The article includes two preview pages and some promotional artwork. I also talk about the second series of Karma Incorporated. Two nights ago, Scott Hinze and I recorded Fanboy Radio #378, the Indie Show with guests Sina Grace and Tony Fleecs. From Pop Syndicate, make sure to read my last installment of Beneath the Underdog before I take a few months off. The CAPE press release is out, and the media blitz has begun. I have a message board. Very few people actually post on it. Please, go there and bother me about something, anything. Stupid question, deep philosphical musing, my opinions on a controversial issue, something bright and shiny to distract me. Happy Ides of March everyone. In high school, my friends and I used to celebrate the "End of the World" on this special day. We'd talk about how the world was going to end, make those last minute preparations... and then we'd wait... and wait... and nothing. Maybe next year? By the way, why didn't anyone tell me TANK GIRL is coming back?! IDW's publishing a new series with co-creator Alan Martin and artist Ashley Wood. Tank Girl. Probably one of my favorite comic book characters on a short list that includes The Rocketeer, Concrete, Freddie Finger from Strangers In Paradise, and Usagi Yojimbo. Also, Nunzio DeFilippis and Christina Weir's website is now online. I designed it, and there's a lot of content that still needs to be added. The art is by Bolivar co-conspirator Diana Nock. Speaking of Bolivar, Diana's been sending more concept art and character designs. I'm not sharing any just yet, but it all looks incredible. More or less finished with the synopsis, I'm working on the script today. On Monday, I saw Starter for 10 with Melissa. Loved it. A comic book convention... free of charge? It's madness! Oh yes, the Dallas Comic Con is next weekend, March 17th and 18th. It will be at the Richardson Civic Center, and not Plano, as it was the past few times. I'll be there with several copies of Smart Pop's Webslinger and Man from Krypton. Last night, Mark Walters invited me on his BigFanBoy LiveCast. The main guest was Clare Kramer who played "Glory" in Buffy. I called in halfway through the show. I talked a bit. Fun, and a little chaotic. This mp3 goes straight to my segment. Goodbye Agent X, I hardly knew you. I've been keeping quiet, but I was rather anxious to post that I found a literary agent. Then, alas, I un-found him. It's true. In December, I e-mailed a particular person (we'll call him "Agent X") who was interested in representing my work. I knew him through some friends. Good guy. I sent Agent X all my books, and he liked them. We even met a month ago for drinks to discuss things further. All in all, it looked like we'd be meeting again to finalize our plans. Today, I received an e-mail. Looks like it's not going to happen. No major controversy to report -- just a work load and timing issue with what he's doing and what I'm doing. Little bit disappointed, but it'll be better in the long run. I mean, doesn't this look like a man with intense literary aspirations? From STAPLE!, Playground Ghosts recorded this lovely reverse psychology convention song. Funny stuff. Also, Mangled Stare presents the Mighty Nerf Wars. Based on actual events, also very funny. I got back from STAPLE! late last night, and skipped out on the live art show (sorry guys); a force much stronger was calling me back to DFW. I knew I wouldn't be able to make Melissa's game, but I figured I could surprise her in time to help clean up and go to the roller derby after party. She was surprised. And while those live art shows are a blast, you all survived without me. Although, I did get a missed call from Brock at 2 AM. Brock? Speaking of, Brock's ¡Bike_Gang! was at the show in full force. He had a spiffy banner, even spiffier t-shirts, and the help of Adam and Steven. It was a lot of fun having them there. Brock printed some mini-comics, which should be available at local comic stores soon -- Orbit, a 24 hour comic and the ¡Bike_Gang! Sketchbook. For anyone who purchased these two minis, it's hard to deny that Brock has one of the most original, and off beat (in a good way), minds in comics. As someone who's worked with him, I can testify... no one thinks the way he does. I can't wait to see the completed ¡Bike_Gang! Other stuff I picked up: I've wanted to get Crazy Papers by Jim Dougan and Danielle Corsetto for awhile, and finally did. I'll read it later today. Will gave me a copy of Mangled Stare #4 as penance for shooting me in the eye with a nerf dart gun, point blank range. It hurt, but honestly, if it means I get such a cool book in exchange -- I'll don't mind getting shot in the eye. The story: I was talking to Danielle, when I noticed she looked off to the right. I followed her glance, turned my head and got nerf'd. All of this started, because I shot Will in the chest with a nerf gun earlier in the day. You win this round, Mangler. But at Cape, I'm bringing safety goggles. I also got Product of the Eighties: Teenage Confessions from the Reagan Era (volume one) by Dana Jones. This mini-comic needs to be a freakin' hardcover book that you can buy at Barnes&Noble or Borders. Put it on the shelf right next to something like Post Secret and Found. Such a simple concept, amusing, witty, a sad confessional -- it's the best kind of satire. There's more to share, but for another time. I gotta get to Gran's house for lunch. Thanks to Rob for allowing me to stay at your place this weekend. Greatly appreciate the hospitality. 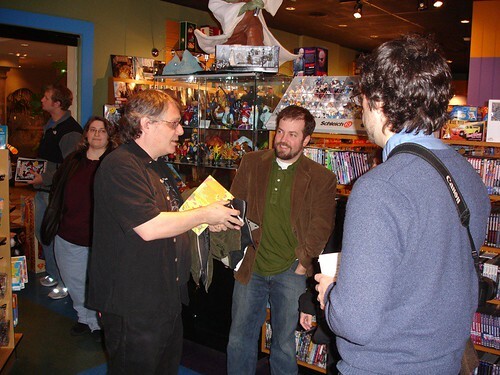 And thank you Chris Nicholas, good ole Uncle Staple, for all the work you do for local comic book creators. UPDATE: Photos from the Mangler. I love that Danielle, Melita, and myself are all trying to eat his oldest son. Here's a flickr set from STAPLE!, includes photos of right after Will nerf'd me. Another set here, includes live art show. This next Wednesday, March 7th, I'll be signing copies of the newest Smart Pop Book Webslinger at Zeus. The event runs from 5 PM to 8 PM. The book will be sold at 25% off cover price, and spidey-cake will be served. Yes, I said spidey-cake. Since I'll be at Staple this weekend, I'm missing Melissa's season opener, vs. the Suicide Shifters. If you're a DFW person, you need to go. It's on Saturday, March 3rd at Forum Skate (1900 S Great Southwest Pkwy) in Grand Prairie. Doors open at 8:30 PM with the skating starting at 9 PM. Expect another capacity crowd. This bout will sell-out. $12 in advance, $15 at the door. Kids 12 and under are free. As usual, feel free to BYOB, but no glass containers are allowed. Since Melissa (Blue Monday) won't have her #1 fan there, you have to go and cheer for me. Take some signs and yell for the ladies on Death Row. Watch as they beat down those Shifters. In non-derby news, I finally got my copy of You'll Have That, Vol.2. Our guest strip is on page 52. Wes Molebash says: "If Karl Malone and John Stockton created comics, they would be David Hopkins and Tom Kurzanski." Hmmm... an interesting analogy. Thanks Wes! I need to mention Aaron Thomas Nelson has a fascinating graphic interpretation of his poem "Lesser Men Rule Over the Middle Lands." Illustrated by Alberto Pessoa (click here). Also, I started reading my first right-to-left manga. Case Closed by Gosho Aoyama. So far, I'm really enjoying it. Leaving Friday for Austin. I'll be at the Austin Books pre-Staple party that evening. Thank you Rob for letting me crash at your house. And then Saturday, it's Staple. They've posted the exhibit hall layout (click here). Brock and I are at table #8 next to Viper. Yesterday, I finished an article, which I wrote for this particular magazine. It will be featured in their May issue. The editor said he liked my piece, thought I was good writer, and invited me to contribute more. Not a bad gig. This whole freelance thing may be worth pursuing. Do you hear that comic book industry?! Start ordering and buying my comics, or I'm dumping you to be a freelance magazine writer guy. Whatever-the-hell they call you people. Diana sent me some character designs. I know she's a good artist, but... dang. You have no idea. I wish I could post the sketches, but it's too early to start teasing. Bolivar's a big project, and it's gonna take awhile. Time to post some links. The official website for Douglas Coupland's movie Everything's Gone Green has been updated, including a list of showings in North America. The US Premiere is at SXSW. Hmmm... will Coupland be there? Unfortunately, I'll have to sit this one out. Last year, I got into the dEUS show without a badge. It might be infinitely more difficult to sneak into a premiere at SXSW. 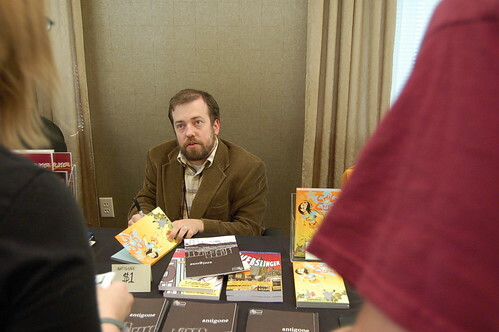 Even if he was there, I'd rather meet Coupland at a book signing anyways. Speaking of, Douglas Coupland posted the cover to his next novel, The Gum Thief. Unfortunately, it features (as you might imagine) a big fat wad of pink chewing gum. Melissa's not going to want that anywhere near her. The novel is set to release Fall 2007. Here's a great Publisher's Weekly interview with Aimee Friedman and Christine Norrie about their graphic novel Breaking Up, published by Graphix. I highly recommend this book. New York Comic Con is this weekend. Congrats to Tim Leong for being named the official NYCC video podcaster. Here's his winning entry. Notice the brief "me" cameo at the Eisner Awards. The CAPE 3 site is now online (click here). Looks great. Kudos to master designer Chris. Check out Cal Slayton's Space Tank. Speeding Bullet Comics posted their top sellers for 2006. Emily Edison is #3 on the list! (click here) Take that Frank Miller and Scott Pilgrim! In your face, Kirkman and all your zombies! Norman Oklahoma loves us more than they love you. Our killer book signing didn't hurt. However, that was just one day. You guys had all year to catch up. Emily triumphs. Is it possible for a news anchor to do a story about comics without referencing Superman? Apparentally not, even when the subject is mini-comics. (click here) All the same, it's a story about one of my favorite comic book stores. The pop gods of middle America: Astrokitty (on MySpace). Unrelated: J.K. Rowling talks about finishing the Harry Potter series (click here). You choo-choo-choose me? Happy V-Day everyone, a day later. Yesterday was quite busy. I had two meetings in Dallas. Can't give any details right now, but good stuff. Afterwards, I met Melissa and Kennedy at the skating ring. Bookmark this site: CORAL CITY AERONAUTS. 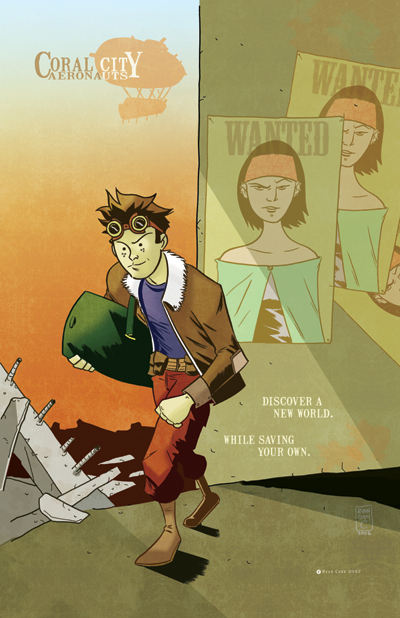 It's a new webcomic by Ryan Cody, and colored by Marlena Hall. Ivy writes about last night's signing at Zeus in the McCloud travel blog. We had a great time. Melissa and Kennedy were able to be there also, so it was nice having the whole family. Dinner was great. I always get a little anxious when we have a crowded restaurant and a large party to be seated, but no problem there. Talked with Sky about Veronica Mars and the curse of reality television. I shared with Scott Kurtz and Mark Walters my idea for a hit new reality show, "Skydiving with the Stars" -- statistically speaking, if the series aired long enough, one of the episodes would be very interesting. Other topics: Movie soundtracks, playing "We Are The Champions" at my funeral... just because, trailers, pop music equivalency in comics, carpal tunnel syndrome, and the Cintiq. Apparently, Kurtz has a biographer who follows him around everywhere. Some reporter guy. Lost track of time, but not as badly as Kristian did. He thought it was 9 PM. It was 11. Afterwards, I drove down to Exclesior for the art show. I knew I was going to be late, but not as late as I was. Sorry. Everything was wrapping up by the time I got there. Brock had been there too. He did a few pieces, and I missed him. I did hang out for a bit with Paul, Aaron, Dana, Chris, and the two owners of Exclesior, which was fun. Although, as a general rule, alcoholic beverages should be kept far, far away from the store owners.